Now that all the festivities are over, it is time for you to face your holiday debt. While there are some people who have saved up to avoid debt, not everyone was able to prepare to handle all their holiday expenses. In fact, a recent report revealed that the average 2017 holiday debt of Americans amounted to $1,054. Most of these are credit card debts. According to the report, shoppers admitted that it will take them a couple of months to completely pay off the debt that they racked up during the holidays. Obviously, starting the new year by paying off your debt might not be the ideal activity. However, if you want to set the year right, you need to start correcting the mistakes of the past as soon as possible. Even if you tried to strengthen your finances before the end of last year, there is still so much to do once we cross over to the next. What most people should realize is that financial management takes constant work. Even if you fixed your finances last year, something can still happen during the present. You need to be constantly in control of your financial position so you can keep on improving it. This is why it is important for you to develop the right financial habits that will allow you to constantly make the right choices during financial transactions. Hopefully, these habits will save you from accumulating holiday debt when 2018 comes to a close. But before we get ahead of ourselves, let us deal with the current debt that was accumulated during the most recent holiday. You may want to start coming up with a plan to pay it off. Dragging it out the rest of the year is usually not a good idea. Fortunately, there are a couple of tips that you can follow to pay off your holiday debt faster. Obviously, you want to pay off at least the minimum of all your debts. But if you have extra money, you might want to choose a debt that you can pay off faster. There are two options: you can pay the debt with the smallest balance or the one with the highest interest rate. When you pay off the one with the smallest balance, you are more likely to finish paying off a debt. If you react to it the right way, you should feel motivated enough to tackle the other debts that you owe. If you choose to pay the one with the highest interest rate, you will save more money on the interest amount that you will pay. According to statistics, roughly $1 billion worth of gift cards is not spent. Do not be part of this statistic. You need to make sure that you use the gift card so you will not waste it. This is free money that you can use. If you have no interest in it, at least sell it. Apart from gift cards, it is also possible to return gifts that you do not like. You will either be given cash for it or store credit. You can use that credit to buy something that you actually need. Of course, you can sell the gift too so you can get actual cash. 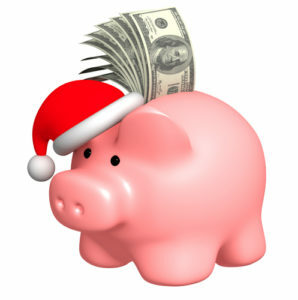 Use the money to pay off some of your holiday debt. If you are serious about getting out of the debt accumulated during the holidays, you have to closely monitor your finances. To be specific, you have to track your expenses. Make sure that you use your money wisely so you can allocate as much as you can towards your debt payments. Fortunately for you, there are many tools that you can use to track your finances. Monitoring how you spend your money is not only for paying off your debt. It is also beneficial in helping you meet all your financial goals. It will be like hitting two birds with one stone. If you need to save for retirement or any other saving goal, you should make sure that you track your spending so you can avoid the unnecessary expenses. Now that the new year has started, you need to force yourself to start the year right. You have to make sure that you will make the right decisions that will end up improving your financial position when this year ends in 12 months. Apparently, 76% of Americans expect that this year will give them a better financial position. Starting the year with this positive mindset is a great way to motivate yourself to make the right decisions. But having the right mindset is not enough if you do not act on it. So here are the things that you need to do. If you do not have a financial goal, it is about time for you to have one. You need to have something to aim for. This will influence your financial decisions. If you are tempted to buy something unnecessary, it is easier for you to say no when you consider your targets for this year. Financial goals include saving for retirement, emergency fund, or a down payment for your home. It can also be paying off your holiday debt. Once you have your financial goals, you need to revise your budget plan. This should complement the goals that you need to meet. Make sure you have enough money allocated to meet your financial targets. Consider the timeline to reach every goal. Then calculate how much you need to save in order to meet a goal. Once you have this budget plan, you need to make a commitment to follow it. A budget plan is nothing unless you use it and follow through with everything that is written on it. There are many debt relief options that you can use. One of them is balance transfer. You can get a new card with 0% interest rate and transfer all your debts to it. You will then aggressively pay off your balance while there is no interest rate being charged to it. Of course, you do not have to get a new card if you can a current credit card with a very low-interest rate. Just make sure you will do the right calculations to make sure you are saving money on this debt relief option. If not, do not worry because there are other options for you to try out. For instance, you can use debt settlement so you do not have to pay the whole balance. You will pay a lump sum and whatever will not be paid should be forgiven. There is also the option to borrow a debt consolidation loan to pay off your multiple debts and end up with only one huge debt to pay off. Regardless of your choice, the bottom line is to have a plan to pay off your debt.